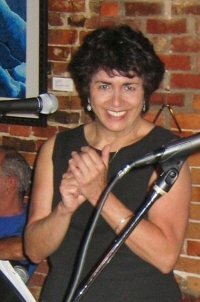 Renee (pronounced Renny) moved to Boston from Augusta, Maine in the early '60's and discovered the Boston/Cambridge folk music scene which was flourishing with the likes of the Cafe Yana, The Unicorn, The Loft, The Orleans, The Sword in the Stone and of course the renowned Club 47. It was then that she began her professional performing career, working for about a year with legendary folk artist Bill Staines in a duo aptly titled, “Bill and Renee”. Together, they had an active performance schedule and, along with John Synnott, recorded an album entitled, “A Bag of Rainbows” which has become a collectors item in recent years. For a short while, following her time with Bill, she performed in the Boston area with another singer-songwriter, Mike Orlen. In late ’69, she moved back to Augusta, settled down and raised a family. However, she continued to perform in numerous venues throughout Maine, including local coffeehouses, taverns, community musical theater and dinner theaters. Bob started performing solo in the 60's as well, at places such as the King's Rook in Ipswich, MA, the New World Gallery in Portsmouth, NH and on to the Sword and the Stone and the Turk's Head on Charles Street in Boston. In the 70's he joined his long time friend Jim King and formed the duo called the Watkins Marsh Bumppe Shoppe (really!!). Together they had an active performing schedule, including being the first performers at the Me and Thee Coffeehouse in Marblehead and reached opening act status at Passim's in Cambridge. The Bumppe Shoppe recorded one album called "Bumpper Croppe"
In the 80's Bob joined with Jon Roper and Myra Franks (now Myra MacLeod) and formed the Generic String Band which evolved into Frosty Morn' with the addition of hammered dulcimer player Sally McKnight. Frosty Morn' performed into the 90's releasing one album entitled "Thin Ice". 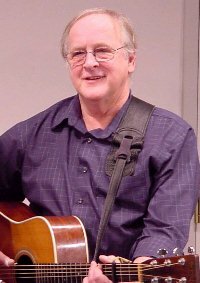 Bob has written over 50 songs, some of which have made it into the Simons and Goodwin repertoire, and has threatened numerous times to release a solo disk. However, the Simons and Goodwin project is the number one priority.